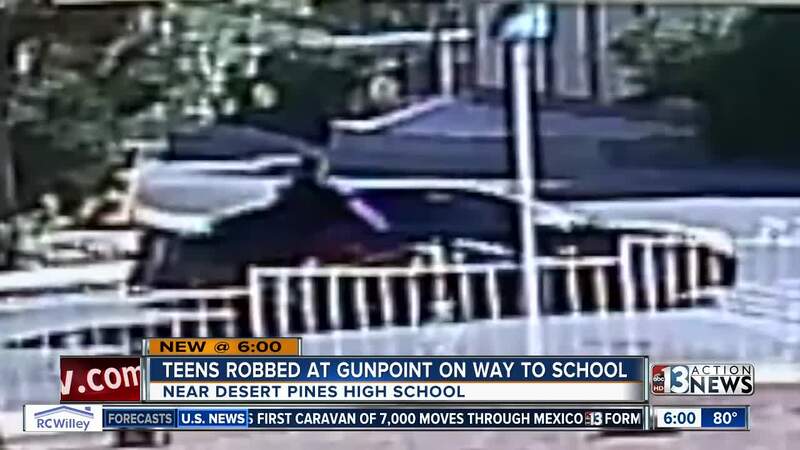 Three people, including two teenagers, were robbed at gunpoint early Tuesday morning near Desert Pines High School. The first incident happened near Sandhill Road and Lighthouse Avenue at approximately 6:37 a.m. That incident involved 2 females in front of a home while on their way to school. The 2 females heard a voice from behind and turned around to find a male pointing a gun at them. The second incident happened near Pecos Road and Owens Avenue approximately 15 minutes later. During that incident, a male was walking on a sidewalk when a sedan cut in front of him. A male exited the vehicle and pointed a gun at the victim and demanded his property. A third incident was reported at approximately 9:58 a.m. in the area of Bracken Avenue and 17th Street. The suspect and vehicle description were the same as the two previous. "The conversations we've had already is just to calm down and go with what the person is asking for so it won't escalate into a bigger situations," said parent Fatima Copian. Copian's freshman son attends Desert Pines High School and was not involved during the morning crime spree. Copian says a gun used to target children is any parents worst nightmare. “This is pretty scary," said Copian. The suspects were described as 2 black males between the ages of 17 and 18, thin builds, and black hair. One suspect was wearing a dark jacket, red shirt and black pants. The second was wearing a dark blue shirt and red pants. The suspect vehicle was described as a black Nissan sedan with tinted windows and no license plates. Police are asking for the public's help in locating the suspects.